Can Indian management really lead a USA high education service provider? Today we became of aware of what one would have thought would be big news--but we've not seen any press releases or information from Pearson, TutorVista, or Smarthinking about the merger of Smarthinking and TutorVista. It seems that not only has Smarthinking also been acquired--evidently Pearson Education is intent on snapping up all the online tutoring providers it can--but also Smarthinking has been put under TutorVista management. For those who don't know, TutorVista is an India-based online tutoring company. Most of the information herein comes then from second-hand news sources except for a small excerpt from TutorVista's "About Us" page, the only recognition we could find from any of these players that in fact this has happened. 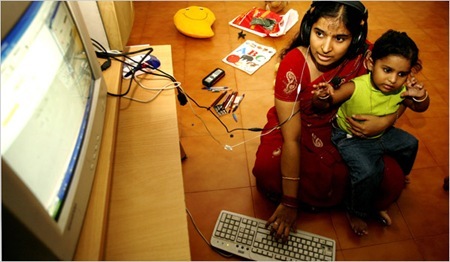 Pearson in increasing its shareholding in Bangalore-based TutorVista to a controlling 76% stake for $127 million. TutorVista supplies digital content and technology platforms to private and government schools and online tutoring, test preparation, curriculum design, and teaching training. Pearson plc in its acquisition of Washington, D.C.-based Smarthinking, a provider of post-secondary online tutoring and academic support programs. Pearson will combine Smarthinking with TutorVista. Value undisclosed. Signal Hill served as exclusive financial advisor to Smarthinking, Inc. (“Smarthinking”) in connection with its sale to TutorVista Global Pvt Ltd (“TutorVista”) and Pearson PLC (“Pearson”). Pearson, the world’s leading learning company, will combine Smarthinking with its recent controlling stake in TutorVista, an India based online tutoring company that provides tutoring services to approximately 10,000 students each month, in addition to providing curriculum design, teacher training, technology solutions and school administration services to 11 schools across India. The combination of these two market leaders will further support Pearson’s goal of building significant education companies in selected fast-growing markets. Smarthinking is the leading provider of post-secondary online tutoring and academic support programs that improve student performance, persistence and retention. Through its proprietary whiteboard queuing technology, the Company serves its customers through a variety of tutoring options in more than 25 subject areas including core subjects such as math, science and business; specialty subjects such as nursing and allied health; and a variety of writing services. With over 475 post-secondary clients and a global network of approximately 1,500 trained professional educators, Smarthinking has established its reputation as the premier online tutoring provider in higher education. The Company was founded in 1999 and is headquartered in Washington, D.C.
For more information on Smarthinking, please visit www.smarthinking.com. TutorVista is headquartered in Bangalore, India. For more information on TutorVista, please visit www.tutorvista.com. Pearson is headquartered in London, UK. For more information on Pearson, please visit www.pearson.com. We've also found a number of job postings (now filled and unavailable) related to the merger. For example, this one from the Pearson Job postings: 19 May 2011 ... Review applications and screening materials for any required staff or consultants and orient them to Smarthinking/TutorVista new program. "is currently the CEO of SMARTHINKING and the CEO & Founder of TutorVista. Both these companies are part of the Pearson Group (NYSE:PSO, UK: PSON), the global leader in education, teacher training, education technology and school solutions"
Sounds like the top higher-ed service provider in the United States is now under Indian management! One cannot help but wonder how this will impact both service providers offering. We reported earlier that TutorVista earned an "F" from the BBB, and that one of its front companies, TutorNext, was called a "online tutoring scam" by the BBB. We also reported about the publication of a report supporting Smarthinking's tutoring's effectiveness Obviously, though, there must be some concern about how this may impact Smarthinking's business--since it seems everyone has been very quiet on this while the Pearson acquisition of TutorVista was news across the industry. All we can do is brace our selves for what might be the most interesting academic year yet in the life of online tutoring. Today I decided that I had enough with them. They been tutoring my daughter for two years in Math and she was either getting D or F grade. I finally I found out that they were basically solving her math home work and she was not learning Math. She is certainly at fault and me as well. I have decided to help her myself from now on and hire a local tutor once in a week. Nice work. It’s been a lot of fun working with your team and watching it grow! Congratulations. To get more info please visit help-essay.com/dissertation-proposal.